The mission of Columbia Memorial Health is to provide our communities with high quality, comprehensive health care in a dignified and compassionate environment. The Hospital Auxiliary is an integral, voluntary association which provides organized services to assist in reaching that mission. 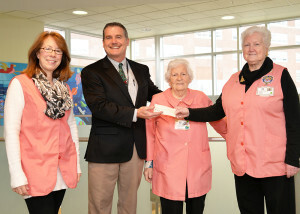 Making a $35,000 donation to CMH! CMH Auxilians experience a special sense of satisfaction from assisting others and they take pride in belonging to an organization that is held in high esteem by the community. Beyond performing a valuable community service, Auxilians develop new skills, learn more about health care, meet new people, and experience a sense of accomplishment. Trusted members of the CMH health care team who scrupulously safeguard the confidentiality of patients and CMH personnel. Valuable resources for the hospital for determining community needs and concerns. Organizers capable of initiating and carrying out community-oriented projects. Community leaders in supporting CMH interests where legislative issues are concerned. Volunteer who believe staying active leads to healthier and happier lives. Members pay $8 dues per year, perform a minimum of 24 hours of service per year, and attend auxiliary meetings. They have a variety of service options available to them. Some active members chose not to work directly with patients. Members pay $40 dues per year. They want to affiliate themselves with the auxiliary primarily in a supportive role. Volunteer service and meeting attendance are optional for sustaining members. Members make a one-time payment of $200. This membership category is selected by people who prefer to dispense with annual payment of dues. Their involvement may be either active or sustaining. Simply call the Auxiliary Office at 518.828.8028 or send an e-mail to auxiliary@cmh-net.org to initiate the application process. Please include your name, address and telephone number. Then, you will be asked to complete a membership application form. If you select active involvement, an interview will be scheduled to discuss your service interests. 1. A health assessment will be scheduled, which will include a physical examination (unless you can provide proof that you received a physical examination within the last 6 months), a blood test, and a PPD test to check for TB. 2. Attendance at an orientation class will be scheduled and on-the-job training will be provided. Membership in the CMH Auxiliary is open to anyone who is interested in its proud tradition of volunteer service on behalf of Columbia Memorial Health. 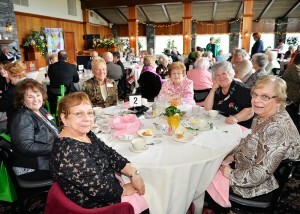 Auxilians at our annual celebration and luncheon. Gentlemen, we would like you to know that the Auxiliary is no longer for ladies only. For a number of years, men have been making a significant contribution within our organization. Event planning: Help organize auxiliary events to benefit CMH. Fund raising: Assist the auxiliary and the hospital’s foundation with various projects. Information desk: Provide information, make deliveries to patients and perform clerical duties. Surgical services: Serve as a liaison between families of patients and Operating Room staff, transport patients, and perform clerical tasks. Patient registration: Register patients and direct them to their treatment areas. Thrift Shop: Serve as a sales person at The Second Show, a resale shop which is the joint venture of Columbia Memorial Health, its auxiliary, and Operation Unite, NY. Knitting and crocheting: Create items to contribute to the hospital’s Family Birth Place, and to residents at Kaaterskill Care, the hospitals nursing home and rehabilitation facility. Baking: Prepare home-baked items for bake sales and other Auxiliary events.